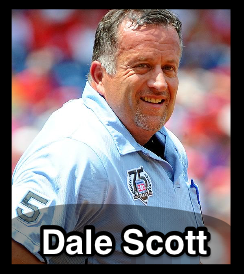 Veteran Crew Chief Dale Scott has retired in the wake of a concussion sustained as plate umpire in Toronto on April 14, 2017. Scott's election of retirement was first reported by the Associated Press. This concludes Scott's 32-year umpiring career in the American League and Major League Baseball since his 1985 debut, 16th as a crew chief, during which he officiated 3,897 regular season games, three All-Star Games (1993, 2001, 11), the 2013 NL Wild Card Game, 12 Division Series (1995, 97, 98, 2001, 03, 04, 05, 07, 11, 14, 15), six League Championship Series (1996, 99, 2000, 02, 09, 13), and three World Series (1998, 2001, 04). Scott, who ejected 90 players, managers, and coaches over the course of his career and often opted to wear umpiring's traditional blue polo shirt behind the plate, received the 2015 UEFL Honorable Umpire of the Year Award after becoming the first umpire to publicly come out as gay in MLB history. He was also one of four MLB umpires—alongside Tim Welke, Laz Diaz, and Mark Carlson—selected to officiate the 2014 Opening Series in Sydney, Australia. Because of his abbreviated 2017 season, Scott was the only "Perfect Replay" umpire in 2017, having two calls affirmed and zero overturned for a 1.000 RAP in his final campaign. > April 14, 2017: Scott is struck in the facemask by a foul ball off of a 95.4-miles-per-hour fastball. > July 16, 2016: Scott takes a fouled-off 91 mph pitch to the lower jaw portion of his mask. > August 7, 2013: Scott is hit in the center of the mask by a fouled and deflected pitch. As for injuries below the neck, Scott left his June 19, 2016 assignment due to a foul ball to the groin, June 24, 2015 game after being struck in the left hip by a line drive while umpiring inside at second base, and a March 5, 2015 Spring Training game after a pitch evaded the catcher and struck Scott's exposed hand/wrist. Scott isn't the first Major League umpire to retire due, in part, to head injuries. In 2013, we revisited Tim Tschida's retirement. Tschida, who, like Scott, suffered several concussions and neck injuries over the course of his umpiring career, elected to retire after hearing from multiple medical professionals and other experts who told him, "you're one hard foul tip [ball] away from quality-of-life issues."